The modern fixed-spool reel is a masterpiece of engineering design. It has banished one of the angler’s oldest problems, that of casting to the required spot, and has doubled, or even trebled the distances over which the average angler can hope to cast accurately. At the same time, it has reduced the problem of tangled line to a minimum. Despite this, we still occasionally hear the reel’s critics bemoaning the fact that it has taken the skill out of casting. Even if this were wholly true, it would be no more a cause for regret than the fact that the washing machine has taken the drudgery out of washing day. The first fixed-spool reel was patented by Alfred Illingworth in 1905. It incorporated all the basic principles of the modern reel, which still hold good today. The line spool was fixed with its axis at right angles to the direction of casting. 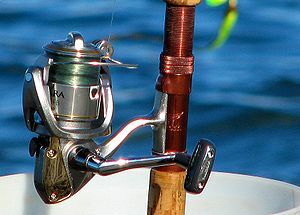 When line was released, as long as the tackle provided the necessary inertia to pull it off, it simply spilled over the edge of the spool, with practically no unnecessary friction, and without requiring the spool to revolve. Hence the modern name-fixed-spool. Line was retrieved simply by hooking it onto a primitive bale-arm, which revolved around the fixed-spool, laying line back when the reel handle was turned. To provide the faster retrieval desired for spinning, Illingworth geared the reel handle to the bale-arm to provide a retrieval ratio of approximately 3:1. The fixed-spool reel has come a long way since those days, and, not long after Illingworth’s first reel, slipping clutches and crosswind reels were developed, although these only entered the market in the early 1930s, not really coming into common usage until after the war. Now it is possible to buy such reels with a wide variety of retrieval ratios suitable for every possible kind of fishing. All have adjustable clutch mechanisms, a reciprocating reel movement which provides even laying of line, and in some cases a crosswind action to prevent the line from jamming. To be effective, such a reel must be properly used. Most manufacturers’ instructions today refer to the loading capacity of the various spools, which varies with the b.s. Of the line required. Many manufacturers provide a spare spool, and since most spools are quickly detachable the angler can change spool and line in a moment. When loading the spool it must be borne in mind that the rotary action of the bale-arm around the spool imparts twist to the line, and that over a hundred yards of line this .becomes considerable, especially when medium-weight lines, which are fairly springy, are employed. 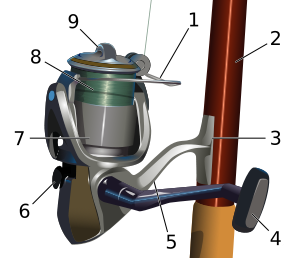 This twist in the line is largely responsible for the manner in which the monofilament lines often tend to spring off the spool. To prevent twist it is recommended that the line be pulled off the manufacturer’s spool not by letting it turn on a pencil as you wind, but over the flange of the manufacturer’s spool in much the same way as the line spills over the edge of the fixed-spool itself. Since pulling line off and laying it on both impart twist to the line, the tactic is to impart opposite twist to the line as the bale-arm lays it on to the spool. When the slipping clutch is set, this must be done so that if a dangerous strain is put on your line, the clutch will slip before the line breaks. This also implies that you must select a line b.s. Suitable for the rod you intend to use. If, for example, your line is of 20 lb b.s. And . You set the clutch at, say, 18 lb, you have a margin of safety of roughly 2lb. However, if you are using a rod of a Vfclb test curve there is con-siderable danger that you will already have strained or damaged, or even broken your rod before the clutch will start to slip. To allow this to happen is clearly absurd, and so lines must be selected to suit the rod. If you must use heavy lines on a light rod you would be better to set the clutch to give when the rod is entering the test curve position, or somewhat before.